Proudly remodeling Long Island since 2010. It went extremely well. Matt (owner of Build Right) is awesome, professional, knowledgeable and just an overall great guy to work with. Needless to say, he has a customer for life. Matt is the real deal. All the glowing reviews here on Angie's List are not too good to be true. They are spot on. First, his professionalism and communication skills are fantastic. He is there to guide you with product and design choices and keeps you involved in every step. He told us what would be involved time wise and budget wise and there were no surprises. Second, Matt and his crew are just great guys. Real positive attitude, happy to be there. You can tell Matt loves his work because it really shows. A pleasure to work with. Third, they were on time, worked quickly and worked very cleanly. They treated our house as if it was their own. The project came out beautifully. Matt and Ralph do really, really nice work with great attention to detail. Everything from the sheet rock work to the painting, to the fixture and hardware installations was flawless. Couldn't be happier. I would highly recommend Build Right and we will definitely be using them again for our next project, a bigger room addition. All went as planned, Matt and his crew Ralph and Rob were at my house a lil after 9:00am they started demo, it took a bit longer as my kitchen had 6 layers of flooring. The job took 2 days; Matt did returned to replace a water valve (it leaked). He also recommend an painter which I also used. Very happy overall! Matt Sprung, owner of Build Right, completed a total gut job for an existing bathroom and I only have the highest of praise for the work he completed. Matt and his associate Ralph were very easy to deal with, listened to my concerns, offered constructive recommendations and completed the project in a timely fashion. 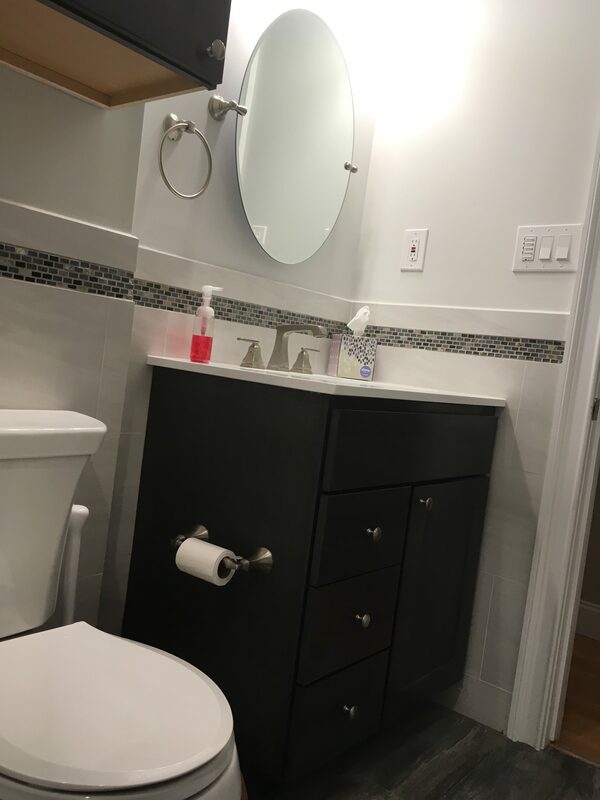 One of my biggest concerns was getting a vanity to fit in an area that had a strange angle. To accomplish this, I bought a vanity which Matt deconstructed and then reconstructed to fit the space! I was very pleased with his work and I would not hesitate to call Matt for any additional renovations. Matthew Sprung and his assistant Ralph did a fantastic job. they were professional and courteous. I felt very comfortable having them in my house. An unforeseen problem and an add-on increased the estimate by an agreed upon amount. We selected and purchased all the cabinets, flooring, appliances and lighting so I felt I had control over the budget. I preferred that to having a few choices from a larger company and not being able to select based on price. He does use other specific tradesmen when needed and all of them where professional and courteous as well. I would absolutely recommend Build Right and Matthew Sprung and plan on having him return for future projects. Excellent workmanship. Attention to details and Matt was right on budget. Matt and Build Right did my laundry room and bathrooms previously and I am very pleased with all work done! Waiting for his estimate for my basement and when they can perform the next project. © Build Right 2019. Businessx theme designed by Acosmin.